"As we try to save more fish, they're eating more and we're not getting ahead." EAST SAND ISLAND, Wash. -- It's been a dozen years since the federal government moved thousands of black-capped squawking seabirds here to reduce their diet of endangered fish. Things haven't exactly gone as planned. The hope in relocating the world's largest colony of Caspian terns to this sandy mound near the river's mouth was that they'd eat more sardines and herring -- and fewer young salmon and steelhead. And they have. But the move came at a price. This year the birds' summer retreat was transformed into a place of violence. A strange chain reaction involving divebombing eagles and marauding gulls kept this colony from producing a single chick. Yet even with this bizarre turn the actual number of threatened fish slurped by birds is higher now than it's ever been. That's because this same desolate scratch of ground in recent years has also become home to the West Coast's largest gathering of double-crested cormorants. Now this small city of gangly, avian beasts swallows far more salmon than terns ever did. "It's alarming. They're eating our lunch, basically," said Gary Fredricks, a National Marine Fisheries Service biologist. "As we try to save more fish, they're eating more and we're not getting ahead." Critics maintain, as they once did about terns, that fish-eating birds are a distraction from what really ails Columbia fish stocks -- troubled fish habitat and hatcheries, hydropower dams and fishing. But there may be no better place than East Sand Island to see how unintended consequences can upend human efforts to re-engineer the animal kingdom. Nature, here -- especially lately -- is at its most unpredictable. "Right now I have to say: We really don't know what next year is going to bring," said Daniel Roby, an Oregon State University professor who has studied these birds for years. On a sunny August Friday, seabird biologist Adam Peck-Richardson hoofed across a sandy beach soon to be swallowed by the tide. He snugged his hat to protect his head from a hail of feces. "It's going to get pretty loud," he said, then made a stooped dash toward a tunnel formed by plastic fencing that served as a barrier of sorts for a sea of birds. The sky erupted in screeching. Peck-Richardson ducked into the tunnel and peered through a hole to take in East Sands' cormorant colony. The brown turkey-sized birds were everywhere. They stood like sentinels on dead tree limbs, lined up along driftwood and waddled to and fro like prehistoric penguins. It's hard to imagine this colony of 27,000 cormorants only numbered a few hundred just 20 years ago. Then again, many bird species that now call East Sand home weren't here back then. In fact, East Sand Island's existence as a seabird paradise actually began with another bird on another island. In the early 1980s, Army Corps of Engineers contractors dredged the river for bigger ships and dumped the spoils in a pile 14 miles upriver. That pile, Rice Island, offered soft sand, a lack of predators and an endless conveyor belt of passing fish. It attracted squadrons of Caspian terns from around the West that had been driven away from their prior haunts. By the mid-1990s some 20,000 had arrived. Panicked researchers figured out they ate up to 16 million salmon smolts a year. So the Corps of Engineers in 1999 got a team of Marines to cover their preferred sandy nesting habitat on Rice Island with wheat and build them a new sandy home downstream on forgotten East Sand Island. They hoped terns would relocate and that East Sand's proximity to the ocean meant the birds would eat more marine fish like anchovies. It worked. Tern consumption of salmon dropped by about two-thirds. But with researchers focused on puffy-white, red-beaked terns, few noticed other fish eaters had found East Sand, too. No one knows why cormorants started showing up in 1989. Researchers presume it was in part the loss of bird habitat elsewhere around the West. Efforts to protect terns and keep people off the island also may have bolstered East Sand's appeal. By a half-dozen years ago it was clear that cormorants -- who eat four times more fish than terns -- were on their way to wolfing too many salmon, too. Only in 2010, however, did scientists realize just how large that salmon appetite had grown: The cormorants that year sucked down 19 million smolts. Even with the reduction in salmon consumption by terns, the two colonies combined now were eating 20 percent of the salmon smolts heading to the sea. "When we came out with that estimate, the federal agencies said, 'This is the last straw. We have to do something,' " said Roby. 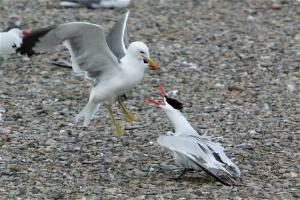 But by then the terns faced a life-and-death duel. Inside a blind on the other side of East Sand Island, Peck-Richardson and two young researchers gazed out over a mostly empty sandy patch. A few hundred Caspian terns remained, but weeks earlier they'd been packed here wing to wing. "They've had a pretty rough summer," Peck-Richardson said. Roughly 9,000 pairs of terns arrived in spring preparing to nest and produce chicks. By early June their summer of love was a disaster. Nearly every day a bald eagle swooped in, plucked an unlucky tern and flapped away to enjoy its meal. The skittish terns would flush and flutter about in chaos, leaving their new eggs exposed to gluttonous gulls. Then a tern-swiping great horned owl showed up, followed by a pair Peregrine falcons. "The gulls just started gobbling their eggs," Roby said. "It was mayhem. It would happen over and over and over until there wasn't a single nest on colony that had anything in it." The terns had nested successfully for a decade, but the previous year fewer than 1 in 10 pairs had reproduced. Researchers blamed El Nino. This year no chicks survived. Scientists aren't certain what brought in the bandit birds, but suspect a late, wet, cold spring reduced forage fish in the estuary. With the massive outpouring of freshwater driving marine fish to sea, eagles and other birds of prey focused instead on terns. Terns are so long-lived they can survive two years of no reproduction, but researchers now wonder how many will come back. "It's possible that a poor year of productivity may cause a larger number of birds to attempt to breed elsewhere," said Oregon State University bird researcher Peter Loschl. Roby agreed. "Caspian terns have evolved to move from colony to colony," he said. "They're always on the lookout for new nesting opportunities." In some ways, that might help bird managers. They'd hoped to eventually shrink East Sand's tern colony, and have created new potential nesting sites from San Francisco to Oregon. But the goal was never to drive off the birds entirely. "Is this a portent of things to come?" Roby asked. "We're not so sure." It's also not clear if more predators will come to like the easy pickings on East Sand Island. "I heard there were several juvenile eagles sitting around each day watching the show," Fredricks said. "Perhaps they were learning." Either way, it still leaves the island's other bird problem. Eagles and falcons have rocked the cormorants, too, but since the bigger birds don't flush in ways that expose their young to gulls, the Corps of Engineers is hunting for new ways to reduce the cormorants' chomping of fish. Federal managers have discussed options ranging from driving birds off East Sand to killing some. It could be a year before formal proposals are developed. Already biologists have shown they could shrink the space inhabited on East Sand by cormorants, simply by pushing a fence line forward and exposing the birds to humans. "They really don't like people," Peck-Richardson said. Roby, for one, hopes solutions allow for at least some of both bird species to remain on East Sand. "As human development progresses along the Pacific Coast there's going to be more and more of these situations," he said. "If we don't make an effort to provide that habitat where we can, we lose the native wildlife species." Still it's unclear, given the pattern on East Sand, whether moving birds will fix the problem -- or if yet another unexpected visitor will change the equation.